View of San Francisco just after the 1849 California Gold Rush. 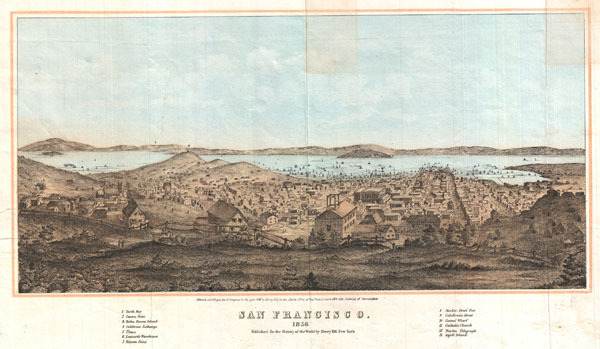 A highly appealing view map of San Francisco dating to 1856. Reveals San Francisco as seen from Nob Hill looking down California Street. Telegraph Hill appears on the left. Shows numerous buildings and ships throughout. The most important buildings and locations are identified numerically. These include North Bay, Contra Costa, Yerba Buena Island, the California Exchange, the Plaza, Leanard's Warehouse, Ricon Point, the Market Street Pier, California Street, Central Warf, the Catholic Church, the Marine Telegraph, and Anjill Island. Published by Henry Bill for inclusion in the 1856 edition of his History of the World. There are seven different printings of this view, the earliest appearing in 1850 with subsequent editions in 1851, 1852, 1854, 1855, 1856, and 1857. Only the 1851 version appears to be from a different plate. Henry Bill (May 18, 1824 - August 14, 1891) was an American book publisher. Born in Groton (now Ledyard), Connecticut to Lucy and Burdon Bill, Henry attended the academy in Plainfield as a boy. After graduation, Bill taught in Groton and Plainfield until, at the age of twenty, a relative, James A. Bill, offered him a job in Philadelphia workin for the book publishing business he owned. Bill spend the next three years learning the publishing business and selling books door to door in the western states. Then, in 1847, Bill moved to Norwich where he opened his own publishing firm. The elder of the Harper Brothers of New York recognized his skill and gave Bill support and an unlimited line of credit. Over the following twenty-five years, Bill's publishing company produced hundreds of thousands of books and by 1865 was among the sixty wealthiest men in Norwich. When faced with failing health and the prospect of retirement, Bill converted his business into a joint-stock company, creating the Henry Bill Publishing Company, which continued to flourish for years. Bill was also involved in politics, serving as a member of the State Senate in 1853. As a member of the Democratic Party, when the party split in 1856, he chose the anti-slavery group, and became an active member of the fledgling Republican Party. Bill was also very successful with his real estate investments and was also one of the founders of Chelsea Savings Bank, serving as the bank's vice president from 1858 until 1882. Bill married Julia O. Chapman on February 10, 1847, with whom he had seven children. Maunder, S., History of the World, (Henry Bill, New York, 1856. Very good. Original fold lines. Minor spot toning to center and upper right corner - see image - that could be professionally neutralized. University of California, Berkley, Bancroft Library, 'Robert B. Honeyman, Jr. Collection of Early Californian and Western American Pictorial Material,' BANC PIC 1963.002:0554--B.